Nothing in life is a sure thing. When your course takes a sudden, unexpected turn, you can either embrace it or fight it and be left behind. Team Flash is frantically trying to find a way to stabilize the Firestorm Matrix within Stein (Victor Garber) before it burns out his body. Cisco (Carlos Valdes) is able to rearrange Wells stabilizer, which helps, but it’s just a temporary fix. They need to find someone with symptoms of the Firestorm Matrix gene mutation caused by exposure to the particle accelerator explosion, who can then merge with Stein and take over for Ronnie. 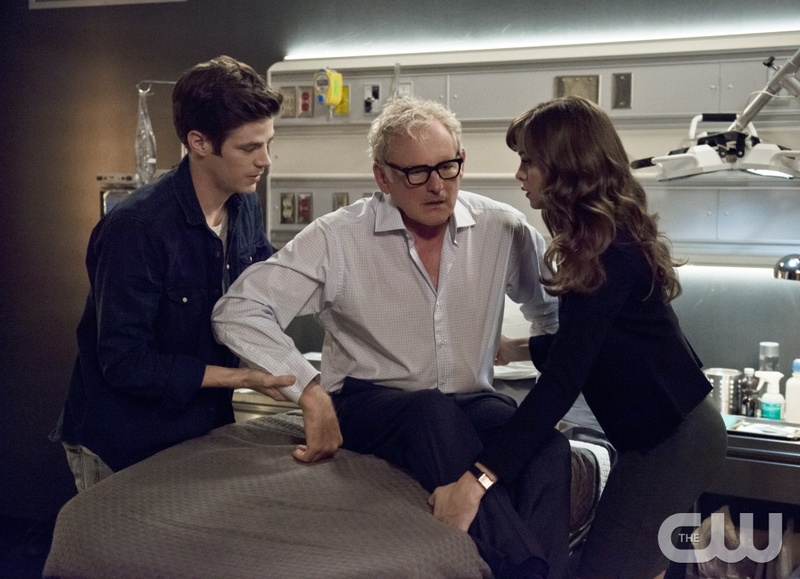 The Flash — “The Fury of Firestorm” — FLA204A_0204b — Pictured (L-R): Grant Gustin as Barry Allen, Victor Garber as Professor Stein and Danielle Panabaker as Caitlin Snow — Photo: Cate Cameron /The CW — ÃÂ© 2015 The CW Network, LLC. All rights reserved. Their search leads them to two candidates. Jefferson “Jax” Jackson (Franz Drameh), a former high school football player who was college bound with a football scholarship before the explosion ended his football career. Now, he works as a car mechanic. The other is Henry Hewitt (Demore Barnes), a promising scientist who just so happened to graduate from Hudson University, just like Stein. In Caitlin’s (Danielle Panabaker) eyes, he is the perfect match, even if Jax’s DNA profile looks more promising. Caitlin jumps the gun and brings Hewitt to Star Labs. Unfortunately, when the merge with Stein is attempted, there is a spark, but then it fizzles. Hewitt is furious. He bought the whole destiny/fate thing and loved the idea of being a Superhero. Storming out, it’s obvious they haven’t seen the last of him. 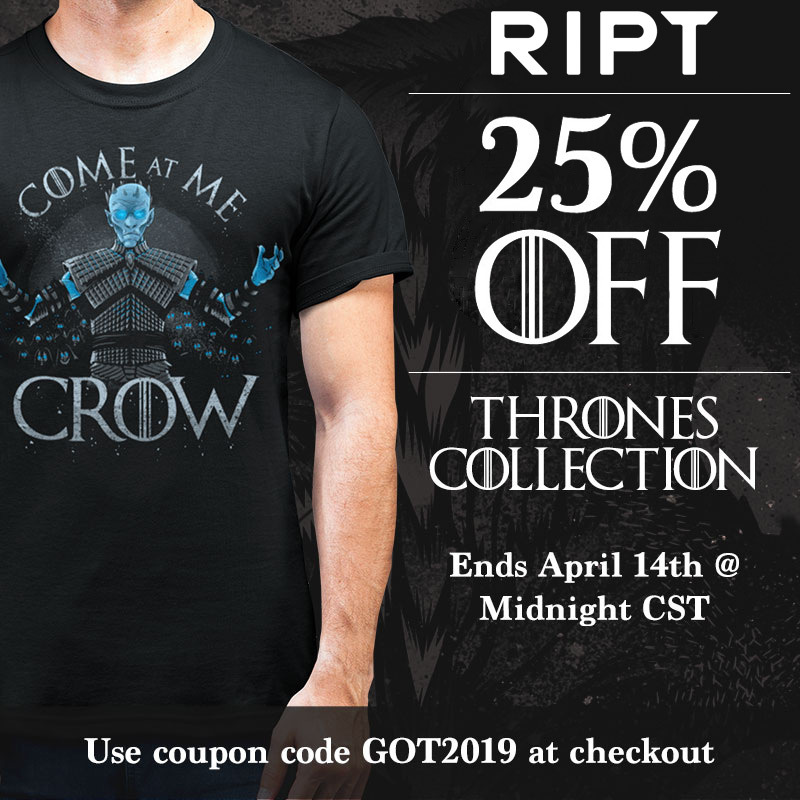 Jax, on the other hand, needs a bit more convincing. He doesn’t buy the Superhero route for his life. He’s already made enough sacrifices at the hands of the accelerator explosion and won’t give up any more. It doesn’t help that Caitlin wears her lack of belief in him on her sleeve, pushing Jax even further away. 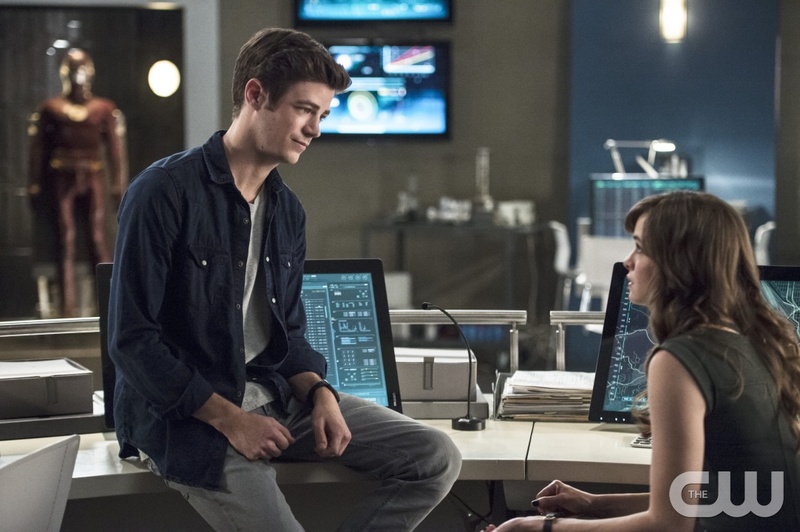 The Flash — “The Fury of Firestorm” — FLA204A_0169b — Pictured (L-R): Grant Gustin as Barry Allen and Danielle Panabaker as Caitlin Snow — Photo: Cate Cameron /The CW — ÃÂ© 2015 The CW Network, LLC. All rights reserved. Barry (Grant Gustin) feels quite differently than Caitlin about Jax and points out that sometimes we don’t see the great possibilities in front of us because we don’t want to. Noting we need to be open to exploring something new. On a side note here –Barry’s speech to Caitlin plays right into the speech Joe (Jesse L. Martin) had previously given Barry in regards to the obvious attraction he has for Patty Spivot. Barry denies it, but Joe can see through his denial. He knows he’s scared. Patty isn’t Iris and it’s better to be safe than take a chance. He doesn’t want his heart hurt again. 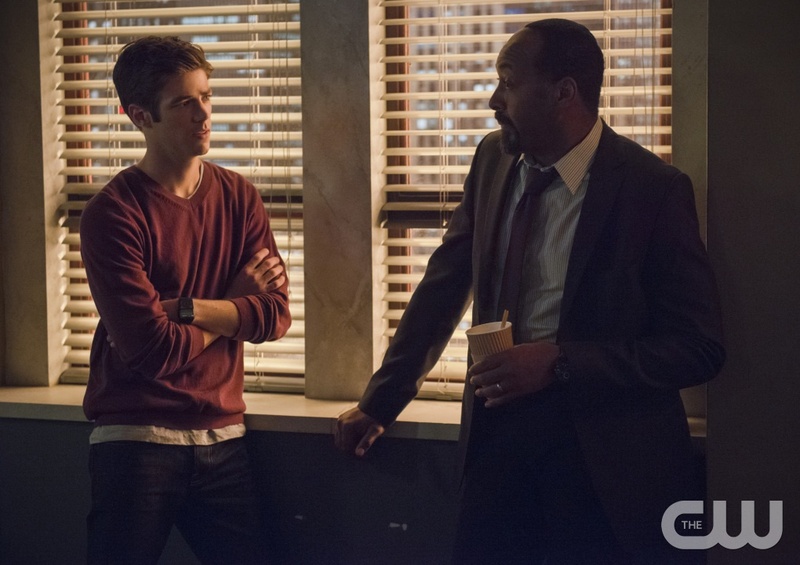 The Flash — “The Fury of Firestorm” — FLA204B_0003b — Pictured (L-R): Grant Gustin as Barry Allen and Jesse L. Martin as Detective Joe West — Photo: Cate Cameron /The CW — ÃÂ© 2015 The CW Network, LLC. All rights reserved. Meanwhile, Hewitt discovers his mini-merge with Stein actually ignited dormant powers. Creating a spontaneous energy malfunction at the lab where he works, he sets off on a path of revenge. Too bad Cisco hadn’t discovered that Hewitt has a history of violence before they brought him in. Realizing her judgement may have been slanted about Jax, Caitlin visits him to apologize. Jax isn’t thrilled to see her, but, he’s willing to listen. Caitlin explains what happened to Ronnie and points out that sometimes when we loose something, we can replace it with something better. Acknowledging that he could be a Superhero, be part of something bigger, help people. Before she can finish, Hewitt shows up, giving Jax a giant zap, throwing him across the room. Jax responds by throwing a heavy car part right at Hewitt’s head, knocking him out long enough for Caitlin and Jax to get away. Back at Star Labs Jax is ready to take the leap. Caitlin’s speech got through to him. Thank goodness, because Stein is on his last leg. With the splicer strapped to Jax’s chest, Stein and him make a connection. The Firestorm Matrix has finally found a home in Jax. A new Firestorm is born. 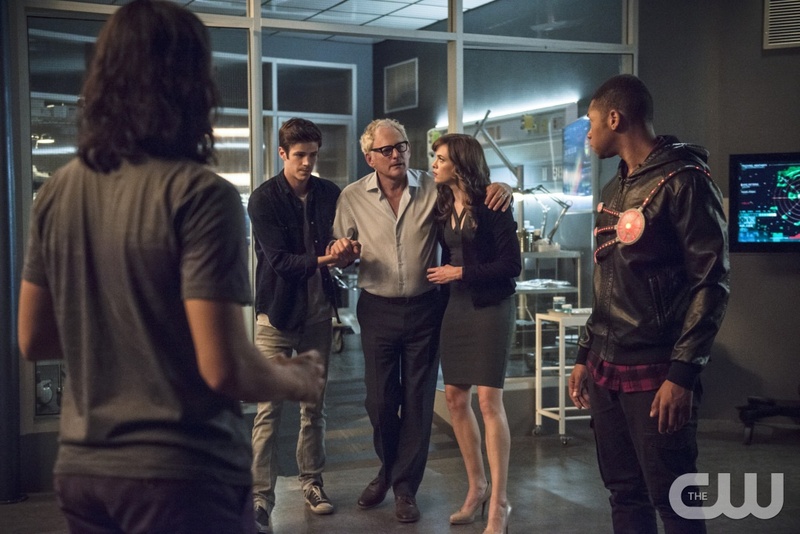 The Flash — “The Fury of Firestorm” — FLA204A_0306b — Pictured (L-R): Carlos Valdes as Cisco Ramon, Grant Gustin as Barry Allen, Victor Garber as Professor Stein, Danielle Panabaker as Caitlin Snow and Franz Drameh as Jax Jackson — Photo: Cate Cameron /The CW — ÃÂ© 2015 The CW Network, LLC. All rights reserved. Now it’s time to deal with Hewitt, who is excising his revenge at the football field at Central City High School, the very place where Jax saw his original future gone down the drain after being injured during the accelerator explosion. Teaming up with the Flash, Jax/Firestorm push Hewitt to the brink of literally blowing his fuse, at which point, Firestorm throws a fireball, knocking Hewitt out and completely defusing him. Through all of this, Joe and Iris (Candice Patton) were detained, dealing with their own “explosive” situation, Francine (Vanessa Williams.) Iris lays it on line when she meets her for the first time, telling her she has no place in their lives after being gone for 20 years. Unfortunately, this isn’t enough to send Francine packing, turns out she is dying and just wants to make peace. Iris, being the investigative journalist that she is, doesn’t just except this. Further digging reveals that she indeed is telling the truth about her illness, but left out the little detail that she gave birth to a boy, 8 months after leaving Central City 20 years ago. Whether the boy is Joe’s is yet to be discovered. This time around Iris is protecting her Dad, telling Francine to leave and never come back. 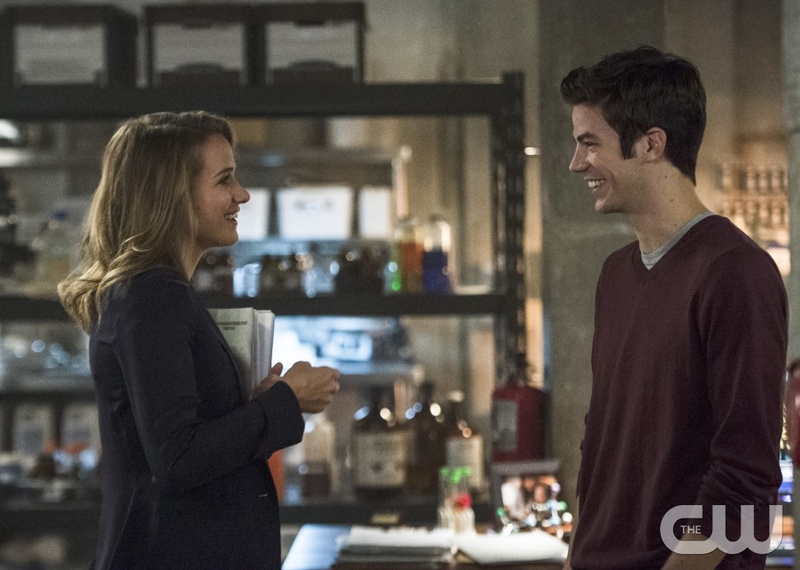 The Flash — “The Fury of Firestorm” — Image FLA204A_0007b — Pictured (L-R): Shantel VanSanten as Patty Spivot and Grant Gustin as Barry Allen — Photo: Cate Cameron /The CW — ÃÂ© 2015 The CW Network, LLC. All rights reserved. Pondering the possibility of taking a chance on love, Flash/Barry finds himself watching Patty (Shantel VanSanten) from afar. Before he can approach, the giant Sharkman that Patty had been tracking, grabs Flash, with intend to destroy, following orders from Zoom. Patty attempts to come to Flash’s aid, but her bullets are no match for this behemoth creature. Out of the dark comes a stranger with a ray gun, shooting Sharkman before he can harm anyone. When Flash corners the stranger, he discovers it’s Wells (Tom Cavanagh), from another world, who has been lurking around Star Labs since he passed through the portal. Looks like this Wells may turn out to be a good guy. Let’s hope, Flash and his Team will most definitely need the extra help in order to defeat Zoom. Well written recap, just watched this one yesterday!